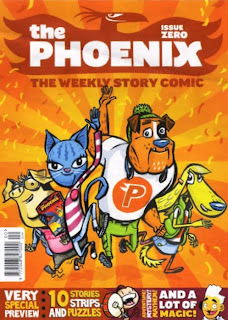 The Phoenix had a bumpier than expected take-off when their distribution deal through Waitrose supermarkets left many potential readers puzzled when no Waitrose had copies of the new comic. We are glad to say that our network of twitchers are now reported sightings of Phoenixes nesting on the shelves of many different Waitrose stores so, if you have a nearby store, this is a nest site that we would be happy for you to raid. It you don't have a nearby Waitrose there is still the option of a taster subscription which gets you five issues (worth £14.95) delivered to your door for just £10. 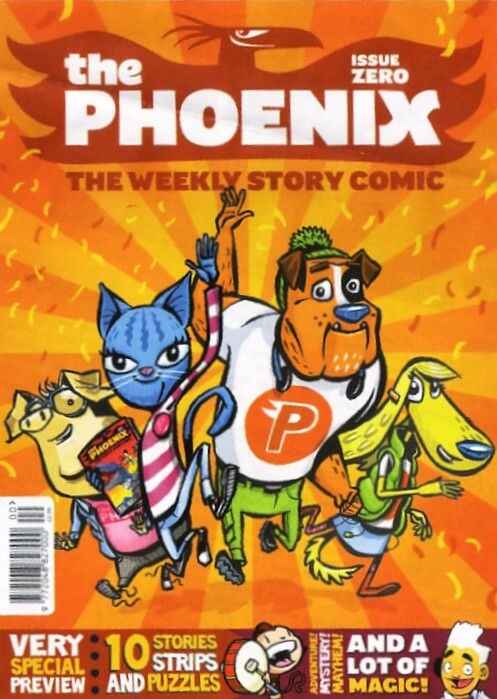 Our review of Phoenix issue 1 is here and the Phoenix website with subscription details is here. Dandy, Phoenix, Corporate Skull Who et al artist and writer Jamie Smart has recently been on the receiving end of criticism of his work that has too often crossed the line into some disgracefully personal attacks. Jamie takes the time to write a very well thought-out and articulated FAQ-style piece on what artists, professional or amateur, should expect when they release their work out into a harsh, cruel world. Jamie's blog piece is here. On a similar note, while we don't hang out on forums much, we have noticed that comics professionals seem to be quietly withdrawing from many of the various comics forums. While such places are poorer when they leave, it is understandable if, for instance, a forum member posts that they hate a particular artist when what they actually mean is that they dislike that artist's work. To a certain extent Facebook has replaced the work of a lot of the forums, as forums previously replaced Yahoo groups. downthetubes gets more comments about our blog pieces on Facebook than on the blog itself and it is a much more pleasant place to be than some forums as people appear to think twice about what they say when they cannot hide behind cryptic nicknames. 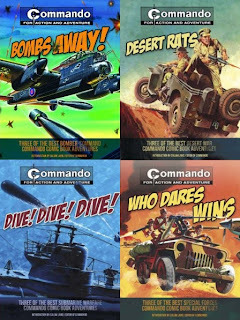 Last year Carlton books issued a set of four Commando paperbacks each containing 3 Commando reprints which were reminiscent of the IPC War and Battle Picture Library Summer Specials from the 1970s and 1980s. They were also considerably cheaper (and lighter) than the big 10 and 12 story oversized reprint books of previous years. 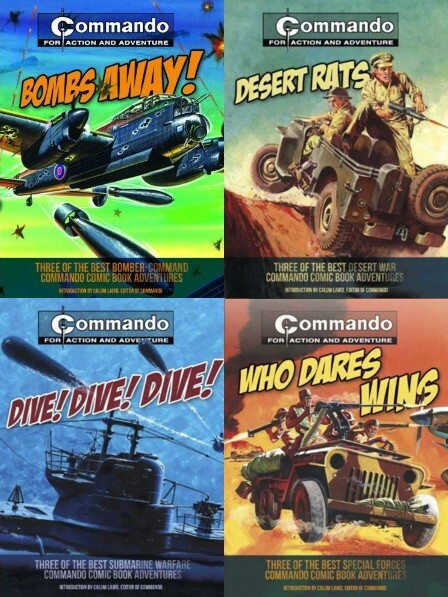 The four titles have proved popular enough that Carlton are issuing a second set of four, each themed around a particular military subject and with stories chosen by Commando editor Calum Laird. The titles are Bombs Away!, Desert Rats, Dive! Dive! Dive! 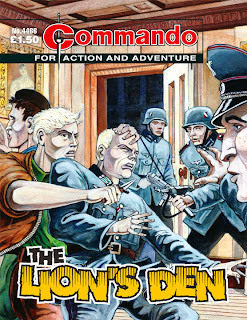 and Who Dares Wins and they are due to be published on 12 April 2012 at a cover price of £4.99 each. Sticking with a DC Thomson theme, the company now has a Broons and Oor Wullie on-line shop, separate from the main DC Thomson e-shop. They have also expanded their range of Broons and Oor Wullie merchandise from the familiar softcover bi-annuals, hardcover reprint books and Ma's cookbooks to include, amongst other things, scarfs, flat caps and baseball caps in the official Broons and Oor Wullie tartans plus a range of jute shopping bags with Broons images on them. 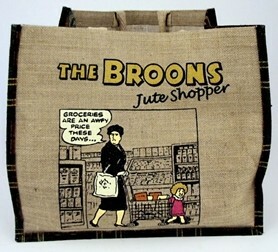 With DC Thomson's hometown of Dundee known for its three J's of Jute, Jam and Journalism our favourite of the new items would have to be the shopping bag, showing Ma Broon despairing of the cost of her groceries, which covers the jute and journalism of the three J's and allows you to add the jam yourself. The Independent has an interesting piece on book illustrators and how, in modern book publishing, internal book illustration has become the preserve of children's books when, in the past, major authors writing for an adult audience such as Charles Dickens would work closely with an artist to illustrate their work. 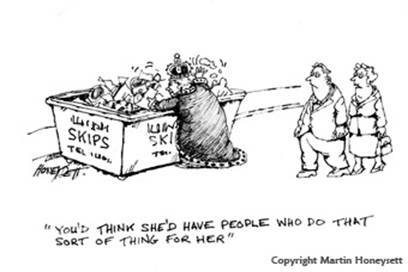 With quotes from the likes of Gerald Scarfe and Posy Simmonds, it is worth a read. US publisher IDW Publishing and Topps have announces multiple Eisner Award-winning creative team for Mars Attacks, an all-new ongoing comic series based on the fan-favourite Mars Attacks franchise - and STRIP Magazine's John McCrea is one part of the line-up. 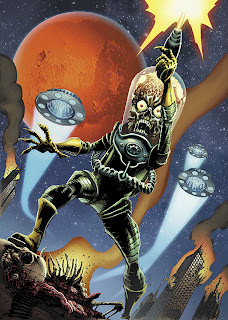 Debuting in June 2012, IDW’s comic series will offer the first stories of an all-new Mars Attacks universe, bringing the brand’s outrageous action and dark humour to a new set of tales. Writer John Layman, author and co-creator of the Eisner-winning series Chew, will script the series, with art by John McCrea, best known for his collaborations with Garth Ennis, including Eisner-winner Hitman, whose creator-owned story, Warpaint, is currently running in STRIP Magazine. Created in 1962, Mars Attacks celebrates its 50th anniversary in 2012 with major product launches throughout the year. IDW’s new comic series, as well as high-quality reprints of existing material, will be a cornerstone of that effort. Originally published by Topps as a series of trading cards, Mars Attacks was created by Len Brown and Woody Gelman, after Brown was inspired by the Wally Wood cover to EC Comics Weird Science #16. The cards went on to achieve cult status for their then-shocking imagery — fully painted by pulp legend Norm Saunders and based on designs by Wood and Bob Powell — and remains a staple of pop culture. Topps revived the franchise in the mid 1990s with a second card set, comic book series and toy line. The story was also adapted into the 1996 feature film Mars Attacks!, directed by Tim Burton. Mars Attacks will include covers by McCrea and alternate covers by such comic-book luminaries as Sam Kieth, Ben Templesmith and Eric Powell. The first issue will also feature a unique approach to variant covers: It will ship with 55 different covers, each depicting one of the original trading cards from the debut set of Mars Attacks from 1962. A complete collector’s set of the 55 covers in a box that replicates the original card packaging will be offered separately as well. • Mars Attacks #1 will be available in stores in June 2012. More info from IDWPublishing.com. For information on Topps visit topps.com. For almost a decade the MCM London Comic Con has been a haven for comics, movies, games and anime – and now, together with the Eagle Awards and upcoming Universal Pictures blockbuster Snow White And The Huntsman, they’re looking to the next decade with a prestigious competition for new comic artists and writers. Judged by Titan Publishing senior editor Steve White, bestselling writer Tony Lee and Eisner-winning artist Mark Buckingham, the ‘Huntsman's Challenge’ competition calls on comic creators to come up with a fully finished, coloured and lettered five page story with a plot relevant to a dark fantasy setting. Submissions will be accepted from 1-29th February 2012 and our judges will select two winners: one for best design and art, the other for best writing quality. Both creative teams will be nominated for a new Eagle Award, the MCM Expo Award For New Visionaries and have their story included in May’s MCM London Comic Con show programme, printed in conjunction with Snow White And The Huntsman from Universal Pictures, who will also provide a selection of prizes. Both winners will also receive invites to the 2012 Eagle Awards ceremony and after-party on the Friday of the MCM London Comic Con, along with industry passes to the full London Comic Con weekend and signing slots in the show’s Comic Village. "Winning an Eagle on your first time out is a story worth telling in its own right," Cooney commented. "Having tens of thousands of people read your story and having it in print alongside a movie like Snow White And The Huntsman is a once-in-a-lifetime opportunity." All accepted entries will receive audience invitations to the May 2012 Eagle Awards. STEVE WHITE: Senior Editor, Titan Publishing: An editor of many of Titan's top comics and graphic novels including the UK Transformers comic, Steve is also an artist, writer and colourist of over 20 years’ experience. MARK BUCKINGHAM: Artist: A multiple Eisner winning artist of over twenty five years standing, Mark is best known for his work on Hellblazer, Miracleman, Doctor Who and his award winning run as the primary artist on Fables for DC/Vertigo. TONY LEE: Writer: A #1 New York Times Best-selling Author, Tony has been a freelance writer for 25 years, and a comic writer for nine of those. Best known as author and ‘showrunner’ of the Doctor Who comic for IDW, Tony's creator-owned comic Hope Falls is currently being adapted into a movie by Future Films. One of the all-time greatest Judge Dredd stories ever told is returning in a brand new pocket-sized format. The Cursed Earth, the first ‘mega-epic’ featuring the famous Lawman of the Future, is being published in B-format for the first time. This hellish radioactive wasteland is filled with hate-filled mutants, flying rats, rampaging monsters and crazed war robots. Many men have attempted to cross it and most have failed, but Judge Dredd has a duty to perform – even if he has to crawl all the way himself! 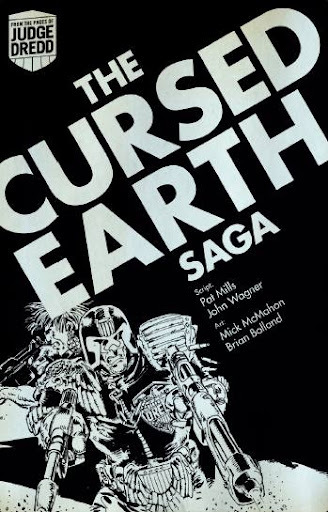 Written by Pat Mills and John Wagner, with art by Mick McMahon and Brian Bolland, The Cursed Earth is the early classic that cemented Dredd’s reputation as the legendary hard man of British comics. These stylish new B-format editions bring the classic Judge Dredd stories from the best-selling Complete Case Files series to open up the world of Dredd to new readers and fans at a low price. Here's some information on both upcoming and recent Panel Borders radio shows, broadcast on Resonabce FM and online. 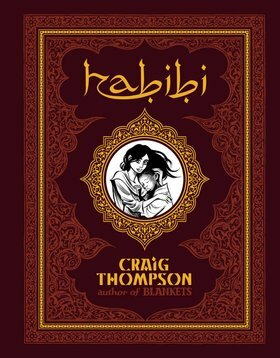 Concluding the show's month of looking at biography and autobiography in comics, Alex Fitch talks to the multiple award winning (and Grammy nominated) cartoonist Craig Thompson about his epic new graphic novel Habibi (My beloved). Alex and Craig discuss the 672 page book's reworking of themes from One Thousand and One Nights, mixing in modern concerns about gender politics and pollution in the Middle East and how his previous autobiographical works Blankets and Carnet de Voyage, with their themes of sexual awakening, religion and travelogue, led to his latest work. In an hour long show about children's book illustration, Alex Fitch talks to three generations of illustrators: David McKee, creator of Mr Benn, King Rollo and Elmer the Patchwork Elephant; Dave McKean, artist of of young adult books by David Almond, graphic novels and picture books by Neil Gaiman and Richard Dawkins' first science book for children The Magic of Reality; and Jim Kay, illustrator of Patrick Ness' A Monster Calls and Toby Forward's Flaxfield Quartet of novels about dragons. The show also includes an extract from Dave McKean's presentation of his work from The Magic of Reality at the book launch in Foyles, September 2011. Recent podcasts include Dotter of Her Father's Eyes in which guest presenter Nicola Streeten interviews Bryan and Mary Talbot about their forthcoming graphic novel, which contrasts two coming of age narratives: Lucia, daughter of James Joyce, and author Mary Talbot, daughter of the Joycean scholar James S Atherton. The British Library in London is offering comic fans the opportunity to join a remarkable panel of artists and experts including Quentin Blake, designer and comic artist Jamie Hewlett, satirical cartoonist Martin Rowson and graphic storyteller Posy Simmonds. Each will select and explain a personal choice of favourite illustrations, drawn from different genres, cultures and styles. Presented in association with House of Illustration, The event will be chaired by Rachel Cooke, columnist and features writer, The Observer. This event is part of the British Library’s Spring Festival, a five day celebration of creativity, fashion and design. As many readers here may already know, ace artist Eddie Campbell has been nominated to receive the Angouleme Festival's Essential Prize at this year's festival for his "Alec" work. Angouleme (http://bdangouleme.com/english/), the "Festival International de la Bande Dessinee" is Europe's largest and most prestigious comics festival and Angouleme's Essential Prize is given to artists for works that are considered, well, essential. Other English language authors nominated for prizes at Angouleme include Dan Clowes, Craig Thompson and Joe Sacco..
“More than just another comic strip. 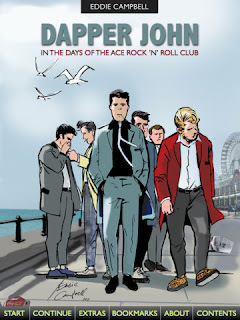 The definitive version of Eddie Campbell’s early work," said Dave Hornsby. London's Cartoon Museum will be celebrating the Diamond Jubilee with a humorous history of the reign of Queen Elizabeth II. Her Maj: 60 Years of Unofficial Portraits of the Queen (1 February – 8 April 2012) will offer a gallery of royal portraits – affectionate, teasing and at times downright unflattering – shows how Her Majesty’s appearance in cartoons has undergone a striking transformation over the course of her reign. Since the early 1900s it was generally accepted that The Monarch might be referred to in cartoons but almost never depicted, and this Royal taboo remained unbroken right into the 1950s. As the veteran cartoonist Wally Fawkes remembers, "At that time there was a much closer link between the Royal Family and God". Her Maj follows the Queen as she emerges from near invisibility into cartoons which respectfully echo her official image on coins, stamps and banknotes, often portraying her in profile or from behind. She is pictured in her robes of state, as Elizabeth I or Britannia, but also as ‘Liz’, an ‘ordinary housewife’ in headscarf and sensible shoes. The 1960s brought a greater emphasis on openness. For better or for worse, the Palace decided to allow the media behind the scenes in the 1969 TV documentary Royal Family. The film inspired cartoonists to imagine what life was really like ‘at home with the Windsors’ in royal residences ankle-deep with corgis. The ups and downs of family life, her husband’s infamous asides, the difficulties with her children and their spouses, problems with the press – all these provide a rich vein of material for cartoonists, as does the knotty question of the Monarchy and public money. Many of the works reflect the fact that the Queen embodies not only the Monarchy, but also the State. Her actions can convey an historic significance beyond that of any prime minister. Cartoons can register key moments in international relations, such as the visit by Emperor Hirohito to Buckingham Palace in 1971 or the Royal visit to Ireland in 2011. She appears in cartoons more frequently during periods when the Commonwealth and the Union are under strain. These ‘unofficial’ portraits, mostly affectionate but sometimes critical, reveal the changing face of Elizabeth II as Sovereign, as symbol and as a wife and mother through her relationships with her family, her governments and her people over the last six decades. The exhibition includes 80 works by over thirty cartoonists including Steve Bell, Peter Brookes, Dave Brown, Michael Cummings, Fluck and Law, Stanley Franklin, Nicholas Garland, Carl Giles, Martin Honeysett, Nicola Jennings, John Jensen, Richard Jolley, MAC, Ken Pyne, Martin Rowson, E. H. Shepard, Ralph Steadman and Trog. As it celebrates three and a half decades of some of the greatest comics of all time, 2000AD is unleashing a flurry of top-notch thrills in graphic novel form this year.The Galaxy’s Greatest Comic has lined up a sizzling schedule of new releases, collecting classics and new strips alike – with new formats and a celebration of amazing Judge Dredd artwork from the past 35 years! February sees the first in the new line of stylish ‘Manga-style’ books reprinting classic tales from Judge Dredd in a fresh pocket-sized format. The perfect format for new readers, this new series breaks classic Judge Dredd stories out from the best-selling Case Files to open up the world of Dredd to new readers and fans at a low price point. JUDGE DREDD: THE CURSED EARTH SAGA (£6.99 ISBN 978-1-781080-08-5) collects the first Dredd ‘mega-epic,’ as the Lawman of the Future crosses the radioactive hell of the Cursed Earth, complete with mutants, monsters and crazed war robots, with a vaccine to save Mega-City Two from a deadly plague. The second release in the series, JUDGE DREDD: THE DAY THE LAW DIED (£6.99 ISBN 978-1-781080-09-2) arrives in May and features art by legends Mike McMahon and Brian Bolland as Dredd is forced to take on the tyrannical Judge Cal. And the third title, due in September, reprints the first appearance of Judge Dredd’s ultimate nemesis, Judge Death, in JUDGE DREDD: THE DARK JUDGES (£6.99 ISBN 978-1-781080-45-0) by John Wagner, Brian Bolland and Brett Ewins. In March, Dan Abnett and Richard Elson’s breakout post-apocalyptic series, Kingdom, returns with 144 full-colour pages of KINGDOM: CALL OF THE WILD (£14.99 ISBN 978-1-907992-98-8). Genetically engineered dogsoldier, Gene the Hackman, and one of the last human beings realise they’ve wandered into the territory of a new pack … and into danger. The first critically-acclaimed Mega-City Undercover collection in 2008 was a runaway hit, and April will see MEGA-CITY UNDERCOVER 02: LIVING THE LOW LIFE (£14.99 ISBN 978-1-781080-41-2). Writer Rob Williams (Iron Age, Daken) and artist D’Israeli (SVK, Scarlet Traces) return for more of the undercover judges who work in the crime-infested Low Life – the nastiest part of Judge Dredd’s Mega-City One – in action-packed, humour-filled stories. Rebellion continue putting the law in order in May, with JUDGE DREDD: THE COMPLETE CASE FILES 19 (£21.99 ISBN 978-1-907992-96-4) collecting the Dredd stories of three of the world’s biggest comic book writers: Grant Morrison, Garth Ennis and Mark Millar, including Morrison’s first Judge Dredd story, Inferno. One of the biggest hits from 2000AD of the last year, the sarcastic, grumpy supernatural detective Absalom gets his first collection in June. ABSALOM: GHOSTS OF LONDON (£10.99 ISBN 978-1-781080-42-9) by Gordon Rennie and Tiernen Trevallion sees the veteran Cockney copper may be dying of cancer, but that doesn’t stop him taking on demonic entities in modern London. A stylish mix of police procedural and occult forces, this collection will be fresh from the weekly comic! Pat Mills’ popular Celtic barbarian returns in SLÁINE: TREASURES OF BRITAIN (£14.99 ISBN 978-1-907992-97-1) in June with art by Dermot Power and Steve Tappin. The follow-up to the best-selling Sláine: Lord of Misrule, this celebrated story has been unavailable for years and includes a new introduction by Mills. Another of Mills’ enduring creations is collected in July. SAVAGE: THE GUV’NOR (£14.99 ISBN 978-1-781080-42-9) by Pat Mills and Patrick Goddard continues lorry driver Bill Savage’s fight against the forces now occupying Britain in this taut nourish epic about guerrilla warfare in a contemporary bombed-out London. In August, JUDGE DREDD RESTRICTED FILES 04 (£19.99 ISBN 978-1-781080-46-7) features writing by John Wagner and Mark Millar, with art from Bryan Talbot, Henry Flint and many more. Featuring rare thrills from 2000AD annuals and specials this best-selling series features never before collected material. He’s the most startling new character to emerge from 2000AD in a decade – a murderous monosyllabic entity bent on revenge for his murdered race. SHAKARA: THE DESTROYER (£14.99 ISBN 978-1-781080-38-2) collects the second half of Robbie Morrison and Henry Flint’s stunning series. Reality teeters on the edge of oblivion in this tale of monumental carnage and devastation, packed with incredible artwork from this breakaway talent. And in the same month the new Dredd film starring Karl Urban hits screens, September sees the first ever 2000AD collectable art book – 2000AD COVER ART FEATURING JUDGE DREDD (£34.99 ISBN 978-1-781080-44-3). Edited by 2000AD graphic novels editor Keith Richardson, this highly-collectable tome will celebrate 2000AD and Judge Dredd’s joint 35th anniversary with a compilation of the most stunning and innovative Judge Dredd-related covers, illustrated by some of the greatest talents in the industry – a must for 2000AD and Dredd fans! The Invisible Artist from Northern Visions/NvTv on Vimeo. The comic booklet: once a mass market media form, some would argue it has all but disappeared from newsagents shelves in the last 20 years - but comic creation continues apace across the UK, including Northern Ireland. A new film released via Vimeo online, featuring comic artists such as 2000AD and STRIP Magazine artist PJ Holden, explores the hidden heritage of Belfast-centric cartooning that goes back centuries. More recently, the vibrant underground publishing scene there, from The Belfast People's Comic (1977) to Patrick Brown's The Cattle Raid of Cooley (2011), has begun to attract attention from establishment arts bodies. The Invisible Artist look at the stories of committed creators in this black sheep media and how they have informed our contemporary culture. The Invisible Artist was written by Andrew Luke and filmed and edited by Carl Boyle of Greater Belfast community group Northern Visions TV. Once a training ground for Channel 4 film-makers, NVTV is free-to-view, and hosts its programmes on Channel 62/799.276MHz in Belfast, with a weekly and omnibus edition, before joining the archive screenings looped rotation. Shows also appear online in the months after airing. NVTV are hoping to raise their broadcasts to appear on Freeview next year. This film was originally screened on 7 November at 4:30pm, and again on 12th, at approximately 12:30. "I'm indebted to Carl Boyle for stepping in to cover the editing and production when my workload became too heavy to cope," says Andrew of the production. "The documentary was shot in a short space of time in early 2011 and captures the vibrancy of the time. "In many ways, The Invisible Artist? is also the story of Davy Francis, a man at the crossroads of four decades of comics creation in Belfast. I'd like to thank Carl, Davy, Paddy Brown, PJ Holden (who called by at the last minute to help out), and everyone who gave their time to make this film happen." 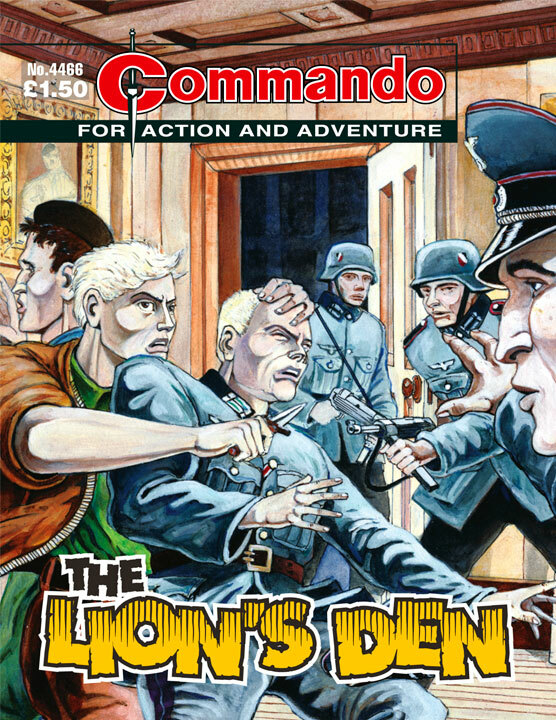 Boffins and Burglars infiltrate Commando! 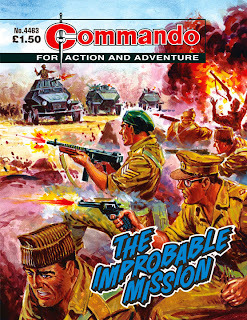 The latest issues of Commando are on sale now, and it's intrguing to see how cover artist Janek Matysiak on #4464 and one of this set's reprint issues, 4466, has changed styles with a move to digital art. Second-Lieutenant Clement Cleveley of the Army Educational corps was a real boffin. A research student before the war, his mathematical speciality was probability theorywhich didn't really fit with anything in service life. In Occupied Europe during the Second World War, dawn raids and midnight arrests became regular occurrences. They were feared by all the occupied peoples but soon they began to lose their ability to invoke terror. It started as a routine training patrol to test five top Aussie recruits - until their radio packed in and their NCO was killed in an accident. Then the dense New Guinea jungle became a terror zone as a bullet flew from out of the shadows. Someone - or something - was trying to kill thembut there wasn't supposed to be an enemy for thousands of miles! Commando Editor Calum Laird. "Here he brings the clammy jungle and a band of dishevelled Japanese to life in a few strokes of the pen and brush. 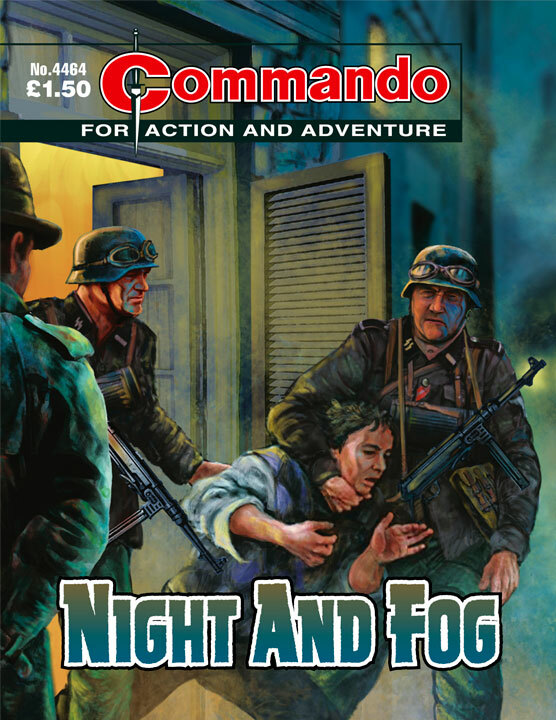 "He's giving form to a story by another long-serving Commando regular, Mike Knowles, whose plots have entertained for long enough to earn him a long-service medal and a well-deserved retirement. 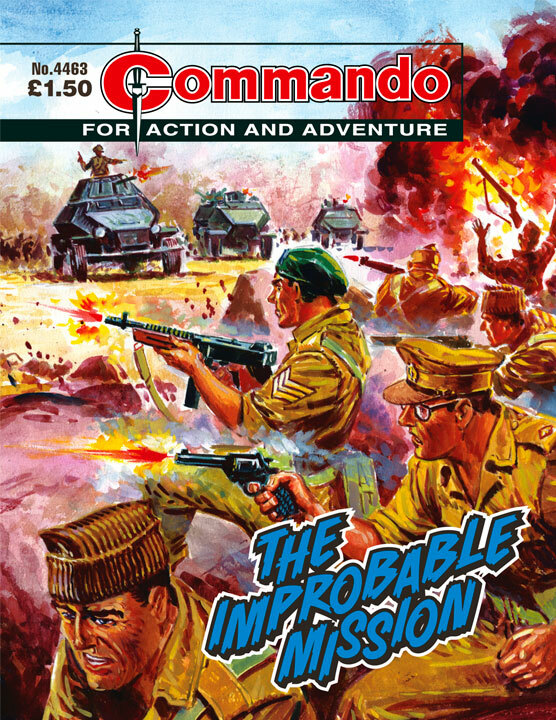 "The late Phil Gascoine did a limited number of Commando covers, but every one was a little gem - even when he had to show an all but invisible figure in the background." That's where safe-cracker turned secret agent Danny Gregg was headed, to wrest secrets from deep within a Nazi lair. And he had to succeed. For Danny the reward would be a pardon from his criminal past. For Britain it could mean the difference between victory and defeat! "At the heart of every Commando story is just that, the story," says Calum Laird. 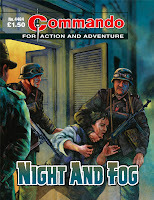 "And here Bernard Gregg, who wrote almost 100 Commando tales between 1972 and 1999, weaves a cracking plot. He takes the safecracker given the chance to go straight idea and gives it a fresh twistor two. "He's ably complemented by artist Janek Matysiak whose detailed artwork and envelope-pushing layouts really bring things to life. 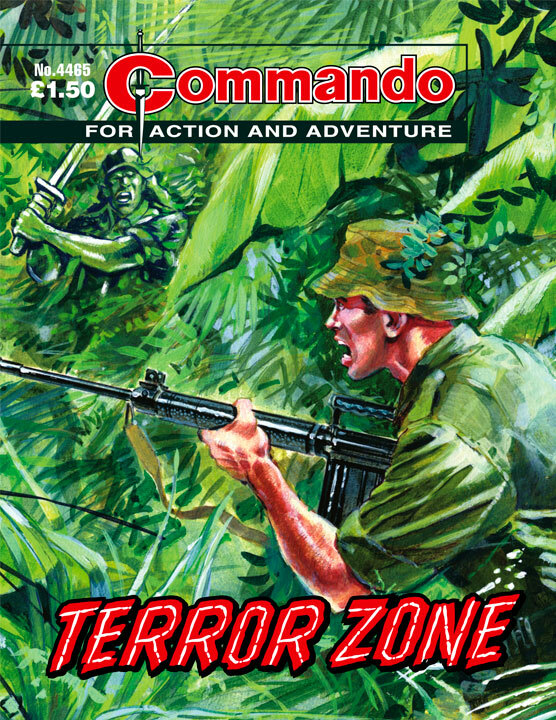 Nearly 20 years later, Janek's still working for Commando doing covers, but this black and white work is up there with the best of them." Ahead of tomorrow’s London Toy Fair, DC Thomson has announced a renewal of its partnership with leading content producer Red Kite Animations to co-produce the new series of Dennis and Gnasher. As The Beano begins the countdown to its 75th anniversary in June next year, there's also news on the The Trial of Dennis the Menace musical, which launches in London next month - and information on the success of The Beano's iPad App. News of more Dennis and Gnasher animation continues DC Thomson’s investment across multi-media platforms, following on from December’s launch of a range of digital subscription apps, including The Beano, which has already had 72,000 downloads. The co-production between Red Kite Animations, a subsidiary of global media enterprise August Media Holdings and Australia’s Sticky Pictures, has been commissioned by CBBC, Network Nine and ABC Australia and will be produced by Sueann Smith for Red Kite Animations and Donna Andrews for Sticky Pictures. The 52 x 11 minute episodes commence production immediately and are scheduled for delivery in summer 2013. 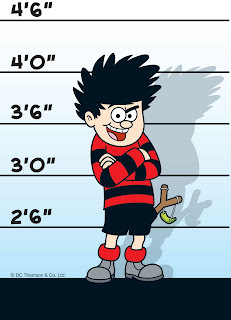 Dennis and Gnasher has been the best performing for CBBC in the competitive 1500-1600 hrs timeslot, reaching nine million people across its most recent (repeat) run in the UK. “After 60 years at the top, the world’s greatest menace still appeals to children of all ages," enthuses Mike Stirling, Editor-in-chief for The Beano and BeanoMax. "We’re delighted to be continuing our partnership with Red Kite Animations and the next series of the successful animation will introduce hilarious new Beanotown characters plus more menacing, laughs and jokes than ever before. 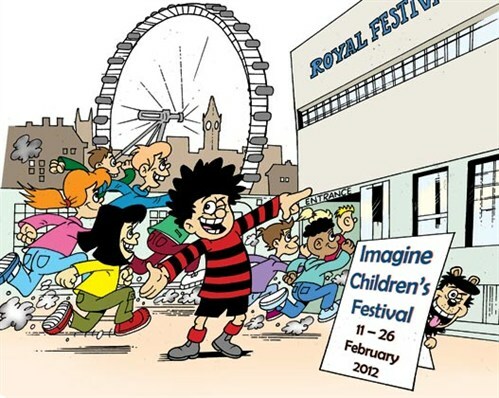 Underlining this increased multi-media investment, Dennis and Gnasher will also be appearing on the London stage next month (17th - 19th February) in the brand new musical commission, The Trial of Dennis the Menace, by Southbank Centre, in conjunction with DC Thomson. This show = part of the Imagine Children's Festival - will bring the world of Beanotown vividly to the stage in the Queen Elizabeth Hall, as part of Southbank Centre’s Imagine Festival. Beanotown declaring war on fun, the show says the kids aren’t guilty! Who is on their side? Find out from 17th February! Aye Write!, Glasgow's Book Festival, run by Glasgow Council's libraries department at the Mitchell Library is much smaller than Edinburgh's International Book Festival but normally turns up some comics talks and this year is no exception. After a poorly advertised, and hence poorly attended, talk with Pat Mills at last year's Edinburgh BookFest, writer Rodge Glass "discusses the process of writing a graphic novel: the challenges of collaboration between writer and artist, and gives tips and advice on making your graphic novel a success." Guardian and Independent political cartoonist Martin Rowson "follows Gulliver’s descendant in a new book that is both a homage to the original and an entirely up-to date indictment of the same, enduring human idiocies that enraged Swift so magnificently and memorably." In addition to the main programme the festival also runs schools events at which Sandra Marrs and John Chalmers of Metaphrog will be running two graphic novel workshops on Thursday 15 March for secondary school year 1 and 2 pupils. There are more details of Aye Write! and how to buy tickets on the Aye Write! website.